Coder anxiety is bound to grow as the ICD-10 deadline approaches, but there are several strategies to help ease the tension. “We do have a long history with ICD-9-CM in place, so there’s always some natural human apprehension to change in general, but as coders become more aware of the guidelines and how the system works, I think that apprehension is decreasing,” says June Bronnert, RHIA, CCS, CCS-P, director of professional practice resources at AHIMA. One of the biggest challenges coders face in transitioning to ICD-10 is simply learning to let go of concepts and guidelines in ICD-9 that may or may not be applicable under the new system, says Bronnert. For example, ICD-9-CM procedure codes, which are indexed according to the intent of a procedure, are strikingly different from ICD-10-PCS codes. Knowing the intent of a procedure for PCS is important in determining the root operation necessary to build the PCS code. This information is not as important when assigning procedure codes in ICD-9-CM, Bronnert says. 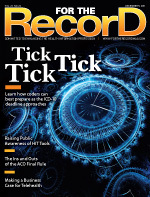 “The more experienced the coder may be in ICD-9-CM, the scarier it might be,” says Nelly Leon-Chisen, RHIA, director of coding and classification for the American Hospital Association (AHA). Coders may not be able to apply knowledge they’ve accumulated through the years, and this may overwhelm some in the profession, she says. Coders’ comfort level with transitioning to ICD-10-CM/PCS may also directly correlate with how—or whether—the organization in which they work has embraced the change, involved coders in the makeover, and communicated the entire change management process to date, says Bonnie Cassidy, MPA, RHIA, FAHIMA, FHIMSS, vice president of HIM product management for QuadraMed and president of AHIMA. When coders aren’t involved in the transition or don’t fully understand a concrete implementation plan, it only worsens their fear of the unknown, she says. Will the hospital use dual coding? Will the hospital start reporting ICD-10-CM/PCS in advance of the deadline? These are just two of the questions that continue to cause anxiety for some coders. “I think the big angst is really around will they have the documentation necessary to do the proper coding and what happens when they have to start querying physicians,” says Joe Nichols, MD, principal of Health Data Consulting and a certified ICD-10-CM/PCS trainer. The good news is that being able to code in ICD-10 is valuable, and hospitals, providers, vendors, consultants, and outsourcing companies will likely aggressively recruit those who have this skill, says Cassidy. “Coders are highly, highly valued professionals. They don’t have to be fearful. They are in a unique, golden position,” she says. Experts say being successful in ICD-10 may require coders to rewire their brains—and not just when it comes to assigning codes in the new system. Several other concerns, such as their role as self-advocates, their relationships with physicians, and their interpretation of physician documentation, will force coders to reassess their thinking. Nichols says coders sometimes don’t take the time to question whether the codes they report accurately depict a patient’s health condition. It’s important for coders to do this today in ICD-9, and it will be equally as important once ICD-10 takes effect, he adds. “On the coding side, I know there is a great deal of comfort in being able to say we did everything perfectly because we did it exactly the way it’s stated in the rule. But if we don’t reflect what the patient’s problem is, then we’ve failed,” Nichols says. Experts say in addition to rethinking relationships with physicians, coders also need to start viewing themselves as self-advocates as well as ICD-10 advocates. Some coders may not be comfortable with this shift in personal perception, says Bradley. However, he views it as a necessary step toward overall success, particularly in the physician practice setting. “Coders need to make sure that the practice management staff and physicians are aware of the scope of this,” Bradley notes. • Can the practice’s software solutions or clearinghouse accommodate ICD-10? • When can the practice begin to send test files that include ICD-10 values? • Do physicians understand that ICD-10 is not simply a technology update? For example, do they know how codes and documentation requirements will change? “If [physicians] believe [ICD-10] is a technology solution, I can see the coder being in the crosshairs,” says Bradley. Physicians need to understand that “technology is the background in this transition,” he adds. However, technology can help ease coders’ transition to ICD-10-CM/PCS, says Cassidy. For example, some vendors offer a mapping tool that coders can use to practice coding current records using both ICD-9-CM and ICD-10-CM/PCS. Coders can also advocate for use of a knowledge-based encoder that includes both ICD-9-CM and ICD-10-CM/PCS capabilities. “The encoder should guide the coder through a clinical assessment, not just a logic tree of typing in words,” Cassidy says. • How much and which parts of the record are electronic? • Does the vendor’s solution include the ability to search text and suggest both ICD-9-CM and ICD-10-CM/PCS codes? • Does the solution cater to inpatient records, outpatient records, ambulatory records, emergency department records, or all of the above? Given ICD-10’s added specificity, increased queries are inevitable. However, in order to avoid becoming overwhelmed, coders will need to grow more comfortable with making some translations based on physician documentation. Experts say it’s unrealistic to expect physicians to document using the exact language in ICD-10-CM/PCS. Understanding surgical procedures, including the intent, objective, and root operation, is an important part of being able to successfully transition to ICD-10, says Leon-Chisen. “You may never see the term ‘extirpation’ in an operative report, but once you read the definition, you’ll know what it means and what the physician is doing. It’s a matter of being familiar with the definition,” she says. Rather than looking at all diagnosis codes, he says coders should first focus on ones that are most frequently reported or that generate the most revenue. Then assess clinical notes to determine whether documentation would support the new specificity in ICD-10-CM/PCS. When communicating with physicians, use actual clinical scenarios to brainstorm how documentation can be improved in the future, he adds. On the inpatient hospital side, coders can advocate for an analysis of case mix index as it relates to ICD-10-CM/PCS, says Cassidy. Articulating the importance of the case mix index, including documentation implications for a hospital’s top 25 diagnosis-related groups, is an area where many coders can shine, she says. Although coders will need to learn the new ICD-10-CM/PCS code sets and guidelines as well as strengthen their knowledge of anatomy and physiology, these are truly the only major content areas that may require any significant training time, says Rhonda Buckholtz, CPC, CPMA, CPC-I, CGSC, COBGC, CPEDC, CENTC, vice president of ICD-10 education and training for AAPC. Many coders—particularly those in the inpatient hospital setting who will need to report ICD-10-PCS codes—are already aware of ICD-10’s specificity and reliance on anatomy and physiology. “Anatomy hasn’t really changed over time, but the way surgical procedures are performed is something that constantly evolves. There’s always something new,” says Bronnert. Coding managers shouldn’t assume that staff members already possess the requisite anatomy, physiology, and pathophysiology expertise they will need to be successful in ICD-10-CM/PCS, says Cassidy. “[ICD-10-PCS] is so complex that I think coders will start specializing in surgical areas such as by surgical clinical departments,” she says. As a result, larger organizations may make the decision to distribute workflow based on coders’ knowledge of specific anatomical areas. Coders working in smaller hospitals may face larger challenges trying to excel in various specialties, Cassidy adds. An assessment of coders’ existing knowledge of anatomy and physiology is a good place to start, says Buckholtz. “They may not need a full-blown anatomy and physiology course,” she says. Conducting such assessments now will help coders know where to focus their training efforts throughout 2012. In-depth code set training should begin in late 2012 to early 2013, Buckholtz says. Coders shouldn’t be afraid to meet with their coding manager or HIM director to get the ball rolling in terms of self-assessment and developing training strategies, says Cassidy. Many coders will actually need an individualized training plan due to the unique knowledge and experience of each individual. Nichols says although the added specificity that necessitates a more in-depth knowledge of anatomy and physiology may pose a challenge for some, it shouldn’t be viewed as an impossible hurdle. “One huge advantage—particularly with Internet connectivity—is that it’s very easy to find information,” he says. It’s important for coders working in a physician practice setting to communicate to physicians that there may be a slight decrease in productivity before, during, and after the transition to ICD-10-CM, says Bradley. “It’s going to depend on how the practice wants to approach this, but as long as everyone has the facts in front of them, the practice can make the best decisions for what makes the most sense,” he says. It’s always a good idea to routinely reevaluate productivity standards, regardless of whether coders are coding in ICD-9-CM or ICD-10-CM/PCS, says Bronnert, adding that the latter will involve a learning curve, and standards should be somewhat flexible. “I’m not sure you’d want to make a long-term change in your standard, so you might want to do something in the short term and then evaluate again as you have more time [with ICD-10],” she adds. This anticipated lag in productivity has prompted some hospitals to consider parallel coding in ICD-9-CM and ICD-10-CM/PCS for as far out as a year in advance of October 2013, says Nichols. But what about the price tag of preparing for ICD-10-CM/PCS? This has been a source of concern for some coders—particularly ones who are paying out of their own pocket for training expenses. “It won’t cost as much as what a lot of people are projecting,” says Buckholtz. Still, the cost will likely be commensurate with a coder’s individual knowledge, experience, and comfort level. It will also be contingent on a coder’s specific role within a facility or practice. For example, if a coder is charged with strategic planning, evaluating documentation, implementing the new code set, and coding records, he or she will need comprehensive training. This may be the case in smaller to medium-sized physician practices, according to Buckholtz. Coders may want to consider training above and beyond what their employer is offering and/or funding, depending on their individual comfort level with ICD-10-CM/PCS, says Bronnert. Leon-Chisen agrees. “There’s no replacement for sitting there and learning on your own. It’s going to take time to process. If you do it during a team meeting, that’s fine, but as a coder and individual, you still probably need to read it on your own and absorb it. It really is a lot to hear it all at once. If you do it as a team, you can dig a little deeper and talk about examples,” she says. Financing ICD-10-CM training may pose unique challenges for coders working in physician practices, says Nichols. “Many physician offices look at ICD-10-CM as a back-office function that needs to get done for payment and not really a clinical part of their business,” he notes. Although many practices generally reimburse coders for continuing education, in the last several years, it has become more difficult to absorb these costs, says Buckholtz. “All practices are suffering a decline of reimbursement. One of the first things to go is education. Coders need to plan early with the provider, administrator, or whoever controls the purse strings to let him or her know that they need this education,” she says. Coders can—and should—take advantage of free resources, says Buckholtz. These include listservs from the Centers for Medicare & Medicaid Services as well as publications from AAPC, AHIMA, the AHA, specialty societies, and state medical organizations. “These are the places you can look to now without having to spend a lot of education money,” she says. Whatever route is chosen, Leon-Chisen recommends starting now. “ICD-10-PCS is so complex that you probably need to be introduced to it, then refresh it in your mind, and go deeper into it later on as opposed to being thrown into a three-day workshop with absolutely no foundation,” she says.